Litigation costs and settlements have made a big dent in Barclays' profits for the first half of the year. Pre-tax profits fell from £2.3bn to £1.6bn after the bank paid out about £2bn, including a £1.4bn settlement with the US Justice Department. But without the charges, pre-tax profits jumped by 20% to £3.7bn, with the UK arm seeing a 30% rise to £826m. Boss Jes Staley called the figures "strong", with the bank starting to show "its true potential". Total revenue for the period was flat at £10.9bn. Shares closed 4.9% lower at 182.3p. Mr Staley, the bank's chief executive, noted in a statement that the charges came in the first three months of the year, and that the last quarter was the first "for some time with no significant litigation or conduct charges, restructuring costs or other exceptional expenses which hit our profitability". "In effect, then, it is the first clear sight of the statutory performance of the business which we have re-engineered over the past two and a half years - Barclays' transatlantic consumer and wholesale bank - and it is a positive sight." Mr Staley added: "This first-half performance shows a bank beginning to demonstrate its true potential and value. Barclays' core capital ratio, a key measure of financial strength and cushion against sudden shocks, rose to 13%, just above analysts' average forecast of 12.9%. In the first three months of 2018, the ratio was 12.7%. Analyst Richard Hunter, head of markets at Interactive Investor, said: "The clouds are beginning to clear at Barclays as it ushers in a new era as a more effective and streamlined global bank... Light at the end of the tunnel seems to be getting brighter." But he added: "Less positively, there a few areas of concern which will need to be addressed. Operating expenses in the UK arm increased, coupled with a decline in income, the cost/income ratio is still higher than some of its peers (although improving) and currency headwinds have hampered performance." 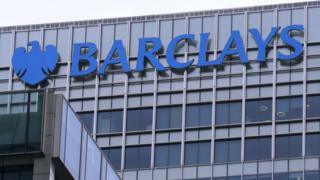 The Barclays share price, which jumped about 1% at the start of trading, began drifting back soon afterwards. New York-based Mr Bramson, who disclosed a surprise 5% stake in Barclays in February, has argued that the bank should pare parts of the investment bank that do not directly serve corporate clients. "We are in conversations with Bramson, I have met him, and we look forward to meeting him post these results," Mr Staley said. "But he has not outlined what his strategy is to us."